I have two Google accounts, say Account1 and Account2. I use and maintain a single calendar from Account1. Each time I'm in Account2 and need to add a calendar event, I log out of Account2 then into Account1 and finally add the event to the calendar. Is there a better way? One option would be to maintain separate calendars for each account but more interesting would be to set Account2 to use (and be able to view, edit, etc) the calendar from Account1...I'd be fine with disabling the calendar for Account2. You can share your main calendar from Account1 with Account2. Just go to the settings (gear, upper right) in Account1, choose Calendars and enter "Share this calendar" right of your main-calendar. Then you can enter the e-mail address of Account2 and choose "Make changes and Manage sharing" and you'll get a notification-mail in Account2 to add that calendar. Now you can manage the complete calendar for Account1 while being logged-in as Account2. 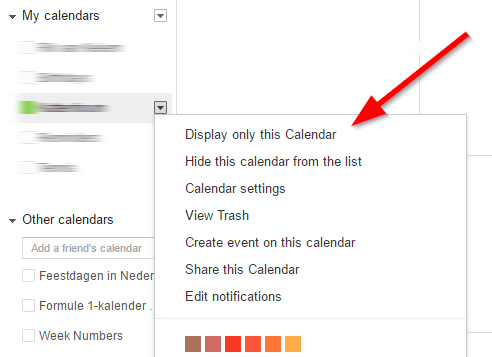 Please note that when adding events, your main calendar of Account2 is checked by default. If you only want Account1s calendar visible you can press the pull-down next to Account1-calendar and choose "Display only this calendar". Any new events will be for Account1 as default. From the wheel icon from the top right select Settings. Under the Calendar tab find the calendar you want to share and in the right you have the option Share this calendar. 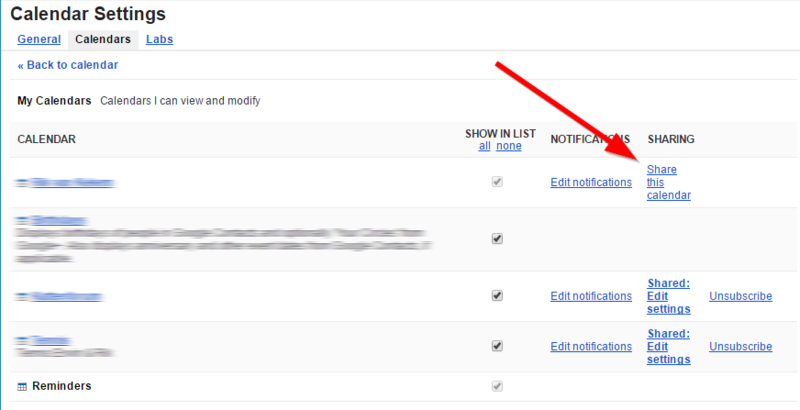 Under Share with specific people add your other email address and select the permission settings you want. Most likely in your case Make changes to events. Not the answer you're looking for? Browse other questions tagged google-calendar google-account synchronization or ask your own question. Multi-account Google Calendar free/busy status?